Jayshree Ullal, President and CEO of Arista Networks, approached me after I spoke at the Arista Customer Exchange in Santa Clara, California and asked if I would like to make a video about my book. I figured it would be a fun adventure, so I said yes. 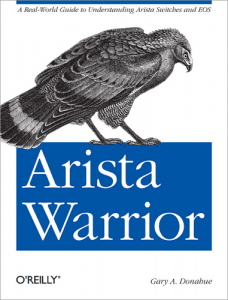 Thanks to Jayshree and everyone at Arista who helped with Arista Warrior. The book is now on sale and can be purchased at Amazon.com, O’Reilly.com, or bookstores that carry O’Reilly books.